At 12:38 a.m. on August 28, 2013 Ocala Police officers Daniel Fitzpatrick, Officer Fried, and Officer Kelly were conducting a security check in the 3800 block of NE 7th Street, where officer Fitzpatrick had parked his car off the side of the road. Officer Fitzpatrick was walking the area on foot when a 2004 Ford F250 traveling eastbound on NE 7th Street veered off the road and slammed into Fitzpatrick’s marked patrol car. Officers say the right front and side of the truck struck the left rear of the patrol car. The damage that was caused is significant according to the police report. The driver of the Ford F250 accelerated and fled the scene, according to the police report. However the two assisting officers quickly caught up with the F250 as the driver was pulling into the driveway of his home located at 578 NE 44th Avenue. 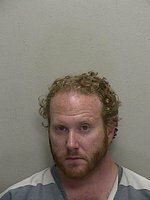 Oscar Sitzer, 33, was not reported to have any injuries as a result of the hit and run. Fitzpatrick also did not sustain any injuries. According to police, Sitzer said he was tired and fell asleep at the wheel. Sitzer said he got scared after he hit the police car and that’s why he fled. However during the arrest police discovered the reason Sitzer was “scared.” Sitzer was in possession of containers [both on his person and in his vehicle] containing traces of marijuana . Sitzer was charged with one count of Leaving the Scene of a Crash with Property Damage in Excess of$10,000, one count of Possession of Controlled Substance, and one count of Possession of Drug Paraphernalia.